Summer is here and all that outdoor barbecue parties are all the rave. Join in the fun of having some outdoor cookout by installing an outdoor kitchen in your backyard. 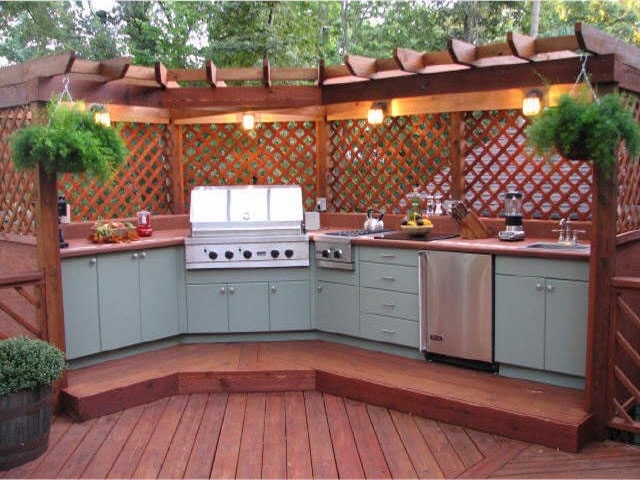 But before you start it, here are 4 key features you should have in your outdoor kitchen. Opt for a heavy-duty countertop. For all the cooking you will do, select a countertop that can handle all the weight it can get. Since it’s also out in the open, make sure it’s durable enough to withstand harmful weather elements. Pick the prime spots for task lights. Whether you’re grilling or having a sit-down dinner outdoors, make sure your lights are well-positioned so you won’t be fumbling for your cutlery or cooking blind. When picking your lighting system, keep in mind that your lights should be able to function without fuss even under the heavy rain. Built-in storage will do wonders for your kitchen tools. Skip the running to and from your kitchen to fetch tongs or plates. Have it ready right in your outdoor kitchen storage and get straight to cooking or feasting on your food fresh off the grill. You can also save space by asking for built-in storage meshed in your seats or countertop. A clever use of space results to less efforts for a cookout in the future. Being out in the open is fun as it is but when the sun gets too hot or the rain starts pouring, you won’t have any choice but bring your fun outdoor cookout back inside. So add a little comfort to your outdoor kitchen by installing a suitable patio cover. Whether it’s a pergola, a shade sail, or an extension of your roof line, keep your outdoor kitchen impregnable from any sudden weather changes.